On the 11th Day of Christmas Hertoolbelt sent to you a wooden sled, another owl ornament, chunky Candy Cane, 3D Snowflake, Rudolph the White Stag Reindeer, People nativity scene, st-a-ck-ed snowman, peppermint candy, 3-tier felt tree, sweater owl, and mini-mittens on a little wooden tree. 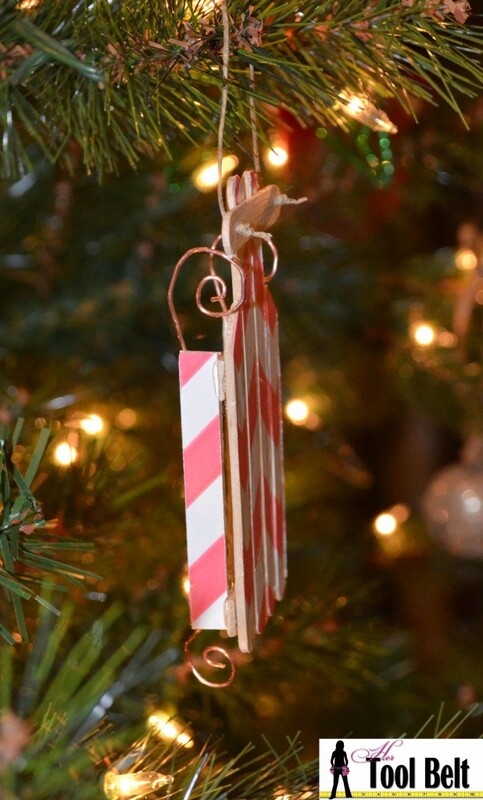 This DIY sled ornament is fun to do with kids. I remember doing something similar in elementary school. Of course you’ll probably want to run the hot glue gun, but the kids will have a blast decorating and making it their own. 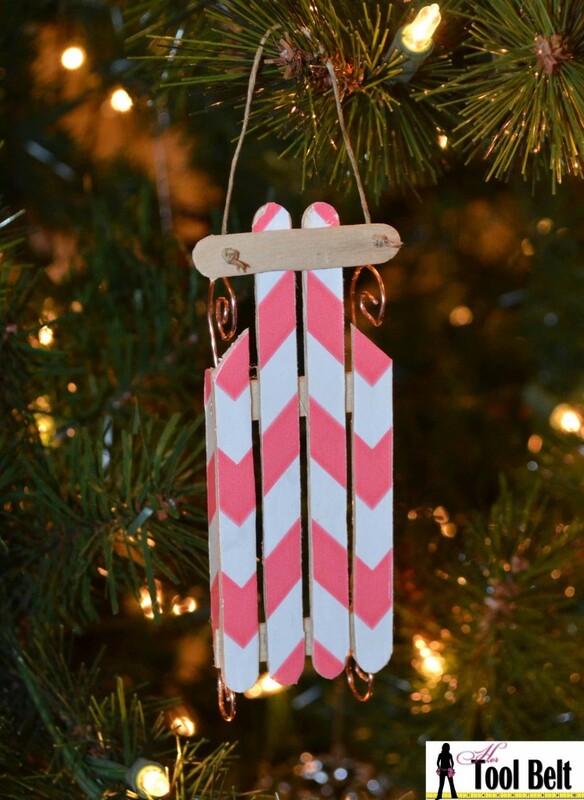 For this sled, I have some fun chevron wrapping paper that I mod podged onto the popsicle sticks. 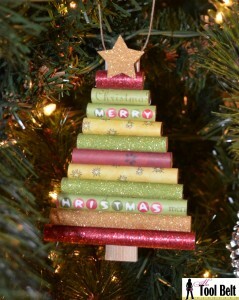 That was a fun and EASY way to add a little something to this ornament. Start with 8 popsicle sticks. If you want to mod podge paper onto the sticks, use 6 of your sticks. 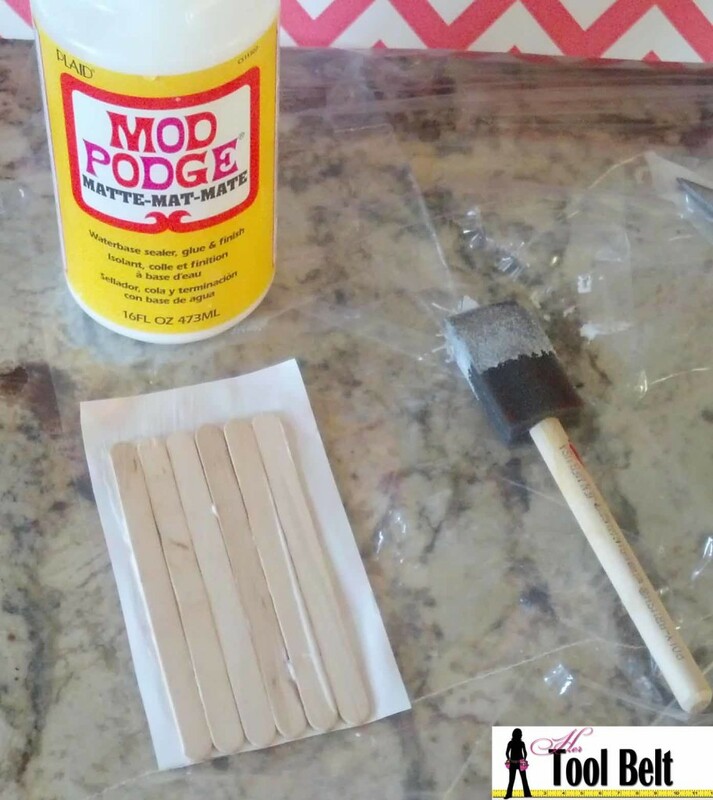 Brush the mod podge onto the paper, and onto the popsicle stick and press firmly into place. Let the mod podge dry sufficiently. Break and cut the sticks from each other, and trim any extra paper. Leave your center 2 popsicle sticks at full length. Cut the 2 popsicle sticks that surround your middle sticks to about 3 1/4″ and tapper off on an angle. Cut the 2 remaining mod podged sticks to about 2 3/4″. 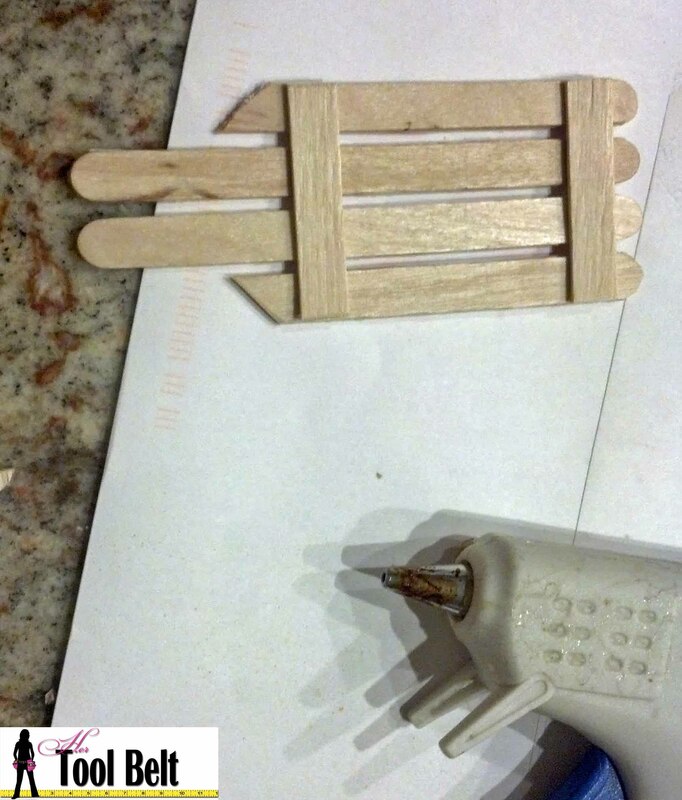 From the plain popsicle sticks, cut 2 pieces that are 1 3/4″ each and 1 piece that is 2″. Round the edges on the 2″ piece. Next glue it up. Start by turning the mod podged piece over and space the pieces evenly, glue them in place with the 2 (1 3/4″) support pieces, one near the bottom and the other near where the angle starts on the outer pieces. Glue the 3 1/4″ pieces into place, they stand vertical like the runners would on a sled. Turn the sled over and near the top of the full length pieces, glue the 2″ handle piece into place. Drill 2 little holes for the rope handle. If you have some extra wire on hand, I thought it would be fun to add some little wire runners. Obviously mine doesn’t represent the true wood runner sled, but it adds a little character. Use the vertical runners as support and glue your wire runners into place, however you’d like. Next cut a 5″-6″ piece of string. Thread it through the holes in the handle and tie a knot large enough that the string will stay. Add more decorations to the sled if you’d like and enjoy your handmade Christmas tree ornament.